This article is about the Royal Navy of the Netherlands. For other Royal Navies, see Royal Navy (disambiguation). "Veiligheid op en vanuit zee." Security on and from the sea. The Royal Netherlands Navy (RNLN) (Dutch: Koninklijke Marine [KM] “Royal Navy”) is the navy of the Netherlands. Its origins date back to the Eighty Years' War (1568–1648), the war of independence from the House of Habsburg who ruled over the Habsburg Netherlands. 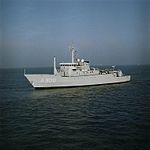 Since World War II the Royal Netherlands Navy has taken part in expeditionary peacekeeping operations. The main naval base is located at Den Helder, North Holland. Secondary naval bases are located at Amsterdam, Vlissingen, Texel, and Willemstad (Curaçao). Netherlands Marine Corps barracks are found in Rotterdam, Doorn, Suffisant on Curaçao, and Savaneta on Aruba. Officers of the Nederland Navy are trained at the Koninklijk Instituut voor de Marine ("Royal Naval Institute"), which is part of the Nederlandse Defensie Academie ("Netherlands defence academy") in Den Helder. Around 100–150 people start training every year. An international prefix for Dutch navy ships is HNLMS (His/Her Netherlands Majesty's Ship). HNMS is also used, although this can also refer to Royal Norwegian Navy ships. The Dutch navy itself uses the prefixes Zr.Ms. (Zijner Majesteits, His Majesty's) when a king is on the throne, and Hr.Ms. (Harer Majesteits, Her Majesty's) when there is a queen. The modern Netherlands Navy dates its founding to a "statute of admiralty" issued by Holy Roman Emperor Maximilian I on January 8, 1488. Naval historians trace the origins of an independent Dutch navy to the early stages of the Eighty Years' War (1568–1648) while the formation of a "national" navy is dated to the establishment of the Dutch Republic in 1597. The Dutch navy was involved in several wars against other European powers from the late 16th century, initially for independence against Spain in European waters, later for shipping lanes, trade and colonies in many parts of the world, notably in four Anglo-Dutch wars against England. During the 17th century the Dutch navy was one of the most powerful navies in the world. As an organization, the navy of the Dutch Republic consisted of five separate admiralties (three of them in Holland, and one each in Friesland and Zeeland), each with its own ships, personnel, shipyards, command structures and revenues. During the Second World War, the Dutch navy was based in Allied countries after the Netherlands was conquered by Nazi Germany in a matter of days: the Dutch navy had its headquarters in London, England, and smaller units in Ceylon (modern day Sri Lanka) and Western Australia. Around the world Dutch naval units were responsible for transporting troops, for example during Operation Dynamo at Dunkirk and on D-Day, they escorted convoys and attacked enemy targets. 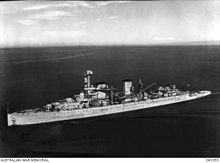 During the war the navy suffered heavy losses, especially in defending the Dutch East Indies, most notably the Battle of the Java Sea in which the commander, Dutchman Karel Doorman, went down with his fleet along with 1,000 of the ships' crew. One Dutch light cruiser that was under construction was captured in its shipyard by Nazi Germany. During the relentless Japanese offensive of February through April 1942 in the Dutch East Indies, the Dutch navy in Asia was virtually annihilated, and it sustained losses of a total of 20 ships (including two of its three light cruisers) and 2,500 sailors killed. The Dutch navy had suffered from years of underfunding and came ill-prepared to face an enemy with more and heavier ships with better weapons, including the Long Lance-torpedo, with which the cruiser Haguro sank the light cruiser HNLMS De Ruyter. A small force of submarines based in Western Australian sank more Japanese ships in the first weeks of the war than the entire British and American navies together during the same period, an exploit which earned Admiral Helfrich the nickname "Ship-a-day Helfrich". The aggressive pace of operations against the Japanese was a contributing factor to both the heavy losses sustained and the greater number of successes scored as compared to the British and Americans in the region. 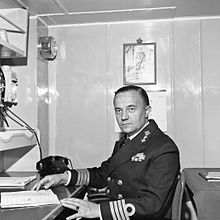 Both British and American forces believed that the Dutch admiral in charge of the joint-Allied force was being far too aggressive. Later in the war, a few Dutch submarines scored some remarkable hits, including one on a Kriegsmarine U-boat U-95 in the Mediterranean Sea, which was sunk by O 21. After the war, the relations between the Netherlands and its colonies changed dramatically. The establishment of the Republic of Indonesia, two days after the Japanese surrender, thwarted the Dutch plans for restoring colonial authority. After four years of war the Netherlands acknowledged the independence of Indonesia. Part of the Dutch Navy was next stationed in Netherlands New Guinea until that, too, was turned over to the Indonesian government in 1962. This followed a campaign of infiltrations by the Indonesian National Armed Forces, supported by modern equipment from the Soviet Union, that was nevertheless successfully repulsed by the Dutch navy. These infiltrations took place after the order of President Sukarno to integrate the territory as an Indonesian province. With the creation of the North Atlantic Treaty Organisation, the military focus was on the army and air force; it was not until the Korean War (1950–53) that the navy got more recognition. The government allowed the creation of a balanced fleet consisting of two naval squadrons. Apart from the aircraft carrier HNLMS Karel Doorman the Dutch navy consisted of two light cruisers (two De Zeven Provinciën class), 12 destroyers (four Holland class, eight Friesland class), eight submarines, six frigates (van Speijk-class frigates), and a considerable number of minesweepers. As a member of NATO, the Netherlands developed its security policy in close cooperation with other members. The establishment of the Warsaw pact in 1955 intensified the arms race between West and East. Technical innovations rapidly emerged, the introduction of radar and sonar were followed by nuclear weapon systems and long-range missiles. The geopolitical situation allowed for a fixed military strategy. Beginning in 1965, the Dutch Navy joined certain permanent NATO squadrons like the Standing Naval Force Atlantic. Contains all surface combatants, replenishment ships, and amphibious support ships. Contains the submarines and a support vessel. Hydrographic surveys are carried out by the Dutch Hydrographic Service (Dienst der Hydrografie). Although the Netherlands Coastguard is not an official part of the Navy, it is under its operational control. Also the Dutch Caribbean Coast Guard is under the operational control of the Navy and is commanded by the commander of the Navy in the Caribbean. In 2012 an Apache attack helicopter from the Royal Netherlands Air Force made a deck landing on board HNLMS Rotterdam for the first time as part of an initial study into the possibilities for wider use of the helicopters as these will be upgraded to the AH-64E standard which has specific features for maritime operations. The Dutch amphibious support ship HNLMS Johan de Witt and the HNLMS Karel Doorman JSS are designed to handle Royal Netherlands Air Force CH-47F Chinook helicopters. But these are not capable of sustained maritime operations due to lack of anti-corrosion measures. Walrus class Submarine 4 1994 Multi-purpose Diesel-electric powered hunter-killer submarines for Deep Ocean Operations and Brown Water & Special Force Operations. SLEP 2015–2019, will be replaced by 4 new subs from 2025 onwards. De Zeven Provinciën class Frigate 4 2002 Mainly Anti-Air Warfare with BMD capability, ASW and with extensive Command & Communication Facilities. Karel Doorman class Joint Logistic Support Ship 1 2014 Combined Amphibious Operations/Seabased Helicopter Platform & Fleet Replenishing, capable of supporting CH-47/AH-64/NH-90 Operations. Mercuur class Submarine Support Vessel 1 1987 Submarine Support Vessel & MCM Command, upgraded in 2017. The total tonnage will be approx. 140,000 tonnes. Next to these ships a lot of other smaller vessels remain in the navy. With these changes the Royal Netherlands Navy will have 10 large oceangoing vessels ranging from medium/low to high combat action ships. The renewed Dutch Navy will be a green-water navy, having enough frigates and auxiliaries to operate far out at sea, while depending on land-based air support, and, with the large amphibious squadron, they will have significant brown-water navy capabilities. Women are expected to join submarine crews in the Royal Netherlands Navy in 2019, with the addition of shower doors and changing room curtains. The Walrus-class submarines replacement in 2025. The sub's are currently undergoing a Service-life Extension Program (SLEP), including new sonar, new optronic periscope and weapon upgrades for near shore operations. The Royal Dutch Navy is evaluating Saab/Damen (A-26), TKMS (Upgraded 212), Navantia S-80 and Naval Group (SSK version of Barracuda) proposal, decision is due early 2019. Upgrading the De Zeven Provinciën-class LCF frigates Theatre Ballistic Missile Defense, acquisition of SM-3 missiles, a new 127mm canon, ESSM-2 and SLCM integration 2018 - 2021 with a planned replacement from 2028 onwards. Replacement of the Karel Doorman-class M frigates in 2025 by initially 4 ships, 2 to be operated by the Belgian Navy and 2 by the Dutch navy, designed & build by Damen Shipyards. See Future Surface Combatant for more information. Replacement of the 6 Alkmaar-class MCM ships from 2024 including MCM Drones. 6 units will be built for both the Belgian and Dutch navies with a total of 12 ships. The contract was won by Naval Group on 15 March 2019. Increasing the size of the Royal Netherlands Marine Corps to remain highly integrated with the British Royal Marines. In 2017 the Ministry of Defence announced the formation of a Fleet Marine Squadron for the protection of merchant ships. The German Navy Seebatallion (Marines) will be integrated into the Royal Netherlands Marine Corps. Cooperation with the German Navy regarding Submarine & Amphibious Operations. Acquisition of a new Combat Support Ship to replace the former Zr.Ms. Amsterdam, designed & build by Damen Shipyards. This ship will be based on the JSS Karel Doorman design to improve type commonality (architecture & components) and is expected to be operational in 2022. Acquisition of new LCU's in 2025 with additional capacity to support amphibious operations and the integration of the German Navy Marines (Seebatallion). Main Naval Weapons will be replaced by acquiring ESSM-2, 127mm canon, Harpoon ASuW replacement, SM-3, SM-2 IIIC SAM, Goalkeeper CIWS replacement, MK 46 & MK 48 Torpedo replacement and SLCM (study). Together with the United States and several other NATO members, the Dutch Navy is testing and updating its ships for Tactical ballistic missile defense capability. Although tests conducted concerning the capability of the APAR (Active Phased Array Radar) have been very successful, in 2018 the Dutch Government decided to acquire the SM-3 missiles for integration into the existing weapon suite of the LCF frigates. Four ships will be fitted out for tactical ballistic missile defense. The four LCFs will be fitted out with only eight SM-3 missiles each, due to the high costs for each missile (approximately $2.5–$5 million). ^ "Koninklijk Instituut voor de Marine". defensie.nl. 13 February 2014. Archived from the original on 24 May 2016. Retrieved 25 May 2016. ^ "List of Acronyms Preceding the Name of a Ship". Corporation of Lower St. Lawrence Pilots. Archived from the original on 2011-07-06. Retrieved 2013-07-31. ^ See for example Paul M. Edwards (2010). Historical Dictionary of the Korean War. p. 114. ISBN 9780810874619. Archived from the original on 2016-05-04. Retrieved 2015-10-23. ^ See for example "King Harald V at Washington Navy Yard Marks Historic Alliance". Royal Norwegian Embassy in Washington. Archived from the original on 2012-07-16. Retrieved 2013-08-01. ^ "Defensieschepen worden meteen Zr. Ms. in plaats van Hr. Ms" (in Dutch). Volkskrant. 2013-01-29. ^ "Geschiedenis marine". defensie.nl. Archived from the original on 28 March 2016. Retrieved 25 May 2016. ^ Klemen, L (1999–2000). "The War at Sea". Forgotten Campaign: The Dutch East Indies Campaign, 1941–1942. Archived from the original on 2012-03-05. Retrieved 2011-06-03. ^ "World Battlefronts: Dutchman's Chance". Time. February 23, 1942. Archived from the original on October 25, 2011. Retrieved June 3, 2011. ^ "Royal Netherlands Navy Takes Delivery of a Mission Planning System for the NH90 NFH Fleet". November 29, 2013. Archived from the original on December 3, 2013. Retrieved November 30, 2013. ^ "RNLN Integrates SeeByte's Neptune into its AUVs". marinetechnologynews.com. Marine Technology News. Archived from the original on 2 April 2019. Retrieved 2 April 2019. ^ "Vrouwen gaan voor het eerst mee in onderzeeër, dus komen er gordijnen en douchedeurtjes voor de privacy" (in Dutch). 9 October 2018. Archived from the original on 18 October 2018. Retrieved 18 October 2018. ^ "France's Naval Group clinches Belgian-Dutch minehunter replacement contract". Naval Today. 15 March 2019. Archived from the original on 15 March 2019. Retrieved 15 March 2019. ^ Scott, Richard (15 March 2019). "Naval Group team selected for BE/NL MCM programme". Jane's 360. London. Archived from the original on 15 March 2019. Retrieved 15 March 2019. ^ Karremann, Jaime. "Marine wil bevoorrader 'in de geest van Zr.Ms. Amsterdam'". marineschepen.nl. Archived from the original on 22 February 2018. Retrieved 22 February 2018. ^ Karremann, Jaime. "Nieuw bevoorradingsschip komt in 2022". marineschepen.nl. Archived from the original on 22 February 2018. Retrieved 22 February 2018. Wikimedia Commons has media related to Navy of the Netherlands.